Here to Explore the Shore? Our communities grew out of a deep connection to the waters of Lake Michigan. Navigation along water trails was critical to the success of travel, trade and settlement. Native Americans, explorers and Voyageurs relied on birch bark canoes for hunting, gathering and fishing. The birch bark canoe has been described as the most beautiful and lightest of all watercrafts. Each canoe was made with the bark of one birch, sewn together with roots of the tamarack tree and sealed with pine resin. Today, we paddle these traditional water trails in search of solitude and recreation. And we still rely on the lake for water, food, travel and commerce. The lake continues to sustain us. Although many improvements have been made to the quality of Lake Michigan's waters, challenges still remain that threaten its health and in turn own own. Each of us can help restore and protect this national treasure through awareness and stewardship. The marker is located at the entrance to the Nature Center at Point Beach State Forest, 9400 County Highway O, Two Rivers, Wisconsin 54241. A view like no other is revealed as you glide along this ancient trail. Experience the feeling of being on the open water as you paddle this diverse coastal shoreline: it's indescribable until you try it. 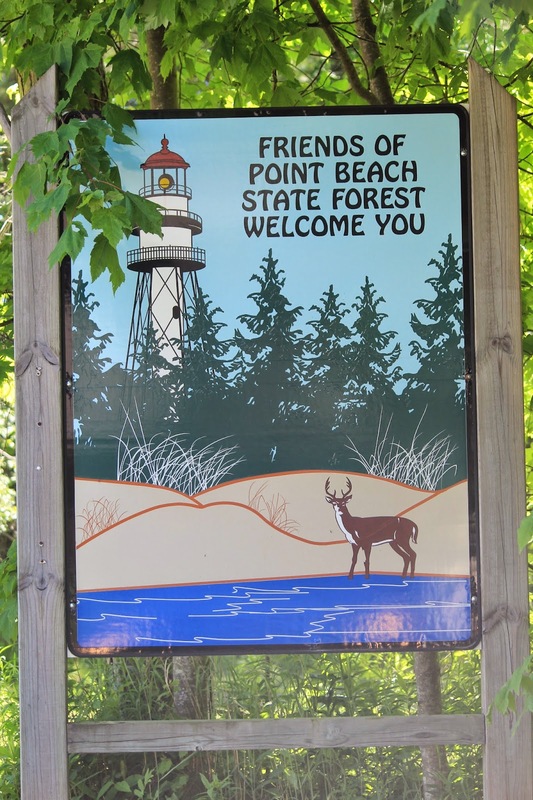 Public access points and campsites along Wisconsin's Lake Michigan Water Trail connect you to the vibrant communities and natural areas on the shores of this treasured landscape. Large coastal marshes, conifer swamps and the Niagara Escarpment are the dominant features. The Menominee, Fox, Peshtigo and Oconto rivers empty into the bay of green Bay. High clay bluffs and major dune complexes characterize the north. Glacial till bluffs, narrow beaches and low wetlands are found to the south. 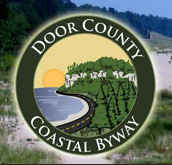 Clay bluffs, sandy beaches with dunes and remnants of beech maple forest extend from the headwaters of the Milwaukee River to the Wisconsin-Illinois state line. A beautiful view of Lake Michigan (looking east). You're welcome, but not your dog! in fact, dogs are not welcome at most locations in the park. 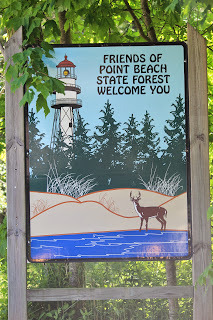 The marker is located at Point Beach State Park.